The La Pavoni Stradavari sixteen cup in chrome with wood handles features a 20 oz. boiler, and internal thermostat. This lever model includes nickel plated non-corrosive brass boilers, recessed power switch, dual frothing cappuccino systems, and a reset safety fuse. Includes a 1-year warranty. 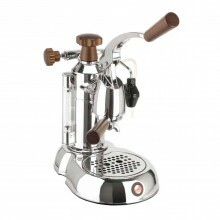 Click the button below to add the La Pavoni Stradavari Espresso Machines wood chrome to your wish list.